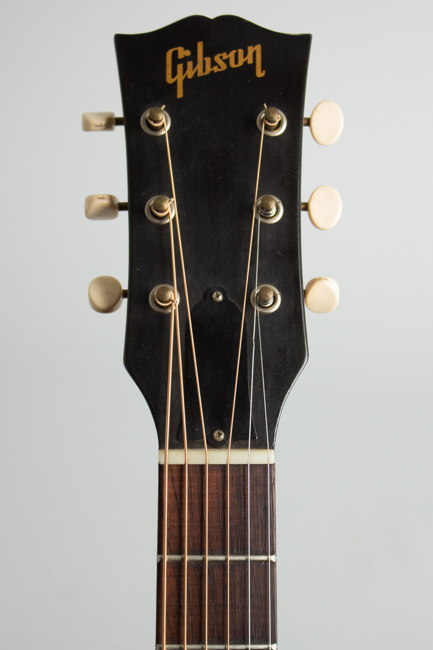 Gibson LG-0 Model Flat Top Acoustic Guitar (1961), made in Kalamazoo, Michigan, serial # 35502, natural lacquer finish, mahogany body, top and neck, rosewood fingerboard, original brown chipboard case. 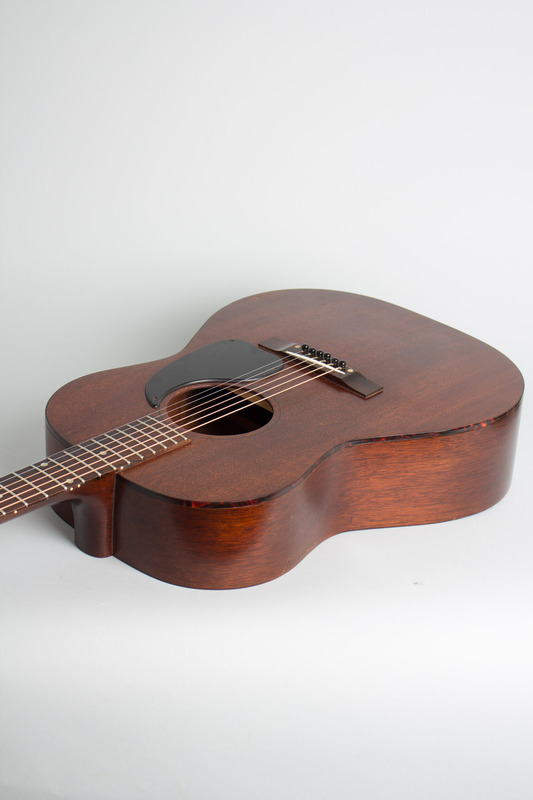 This is an all-original example of Gibson's least expensive flat-top from the 1960s, the LG-0. 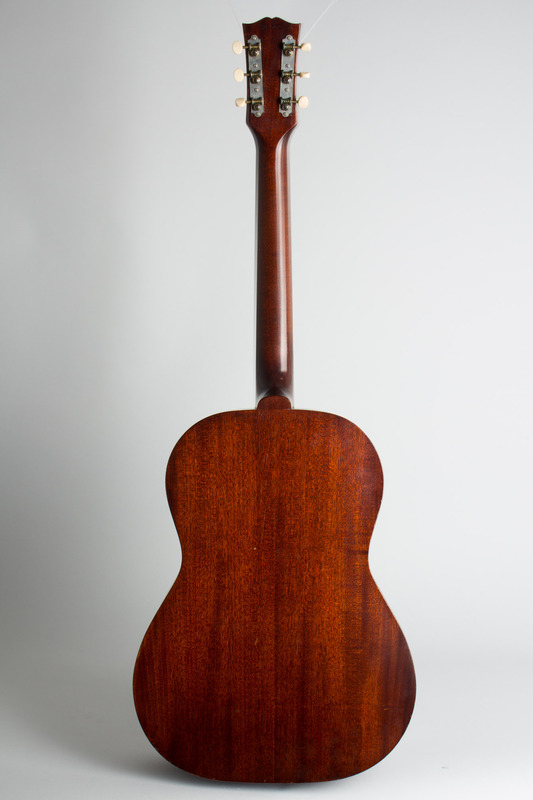 Intended for students, it features all mahogany construction with a tortoise celluloid-bound solid mahogany top and ladder bracing. 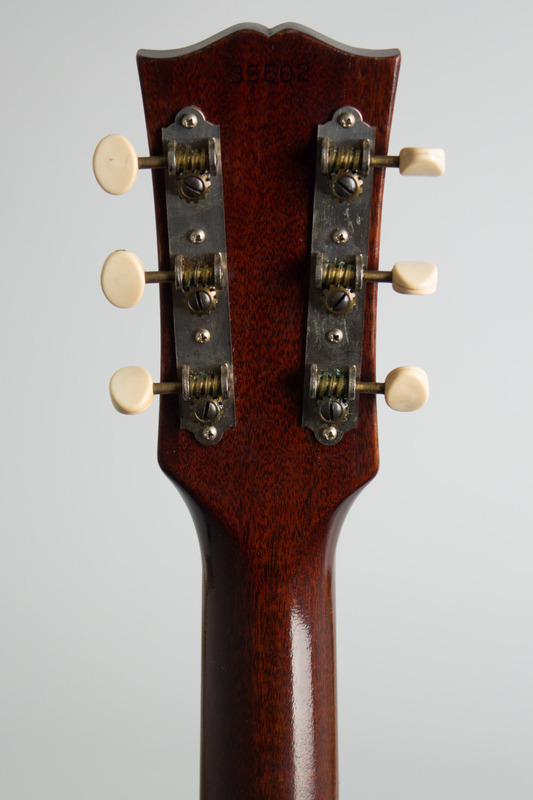 This early '60s example still has the traditional small rectangular wooden bridge, replaced not long after with the dreaded bolt-on plastic bridge unit. Fittings are as simple as possible; the black plastic pickguard is screwed to the top, and the tuners are the plainest Waverly strip units with plastic buttons. This 1961 example has a wide, flatter neck profile and 1 11/16" fingerboard at the nut common to the early '60s Gibsons that most players prefer to the post '65-style narrow nut. The LG-0 is about as simple as a Gibson ever got, but true to the company's intentions, still a great-playing and surprisingly good-sounding little guitar. Overall length is 39 1/2 in. (100.3 cm. ), 14 1/8 in. (35.9 cm.) wide at lower bout, and 4 1/2 in. (11.4 cm.) in depth at side, taken at the end block. Scale length is 24 3/4 in. (629 mm.). Width of nut is 1 11/16 in. (43 mm.). This LG-0 is nice and clean with just some light finish wear and a bit of scuffing to the pickguard. 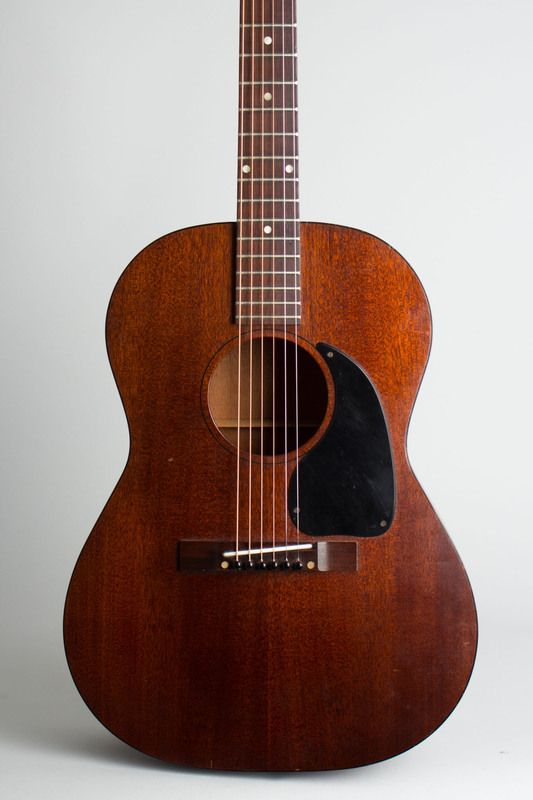 This guitar's wooden bridge is intact and helps this one be a better-sounding LG than most later examples with the 1960s plastic bridge. 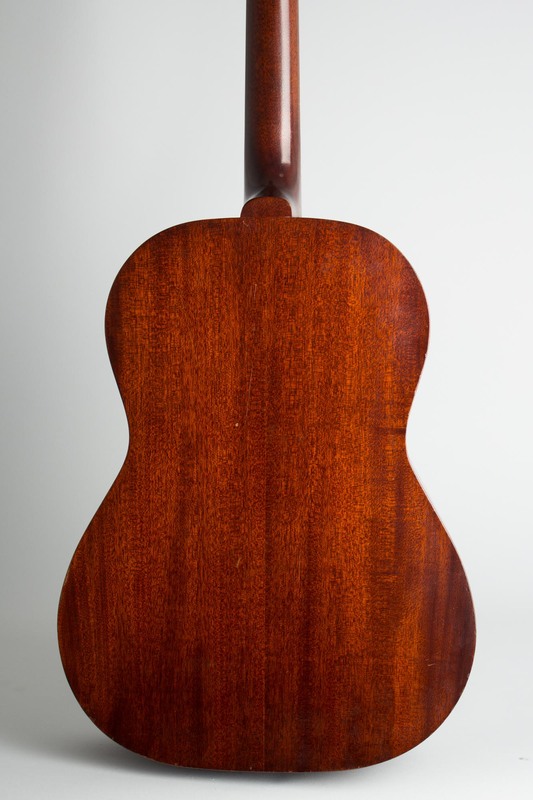 The flatter neck profile with the wider early '60s nut is the other distinguishing characteristic, and quite comfortable to play. 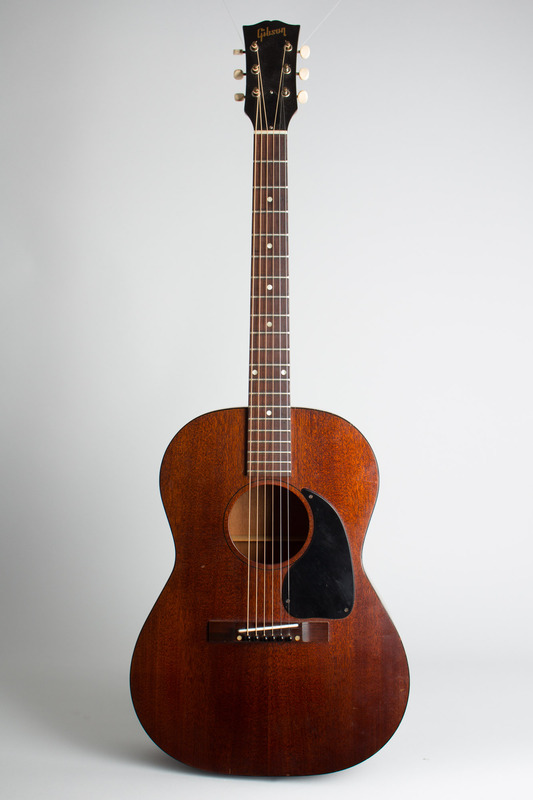 Overall a really nice example of the early '60s guitar that helped many students become Gibson fans for life. Excellent Condition.